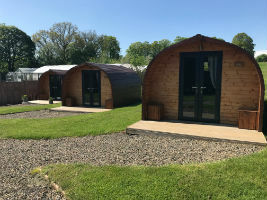 Bleathwood Lodges offer a peaceful country glamping retreat for couples and friends in an idyllic, adult only environment. Dogs are very welcome, with large grounds to exercise on, and footpaths leading in both directions from the lodges. 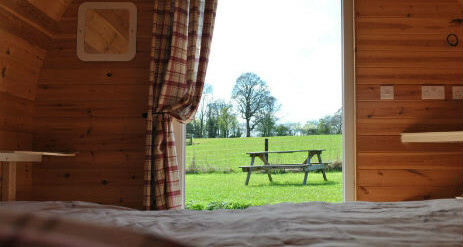 Set in beautiful countryside with easy access to forestry, hills, castles, stately homes, gardens, dog friendly pubs, and in an area famous for its local food produce, the site offers a relaxed base from which to explore the area. 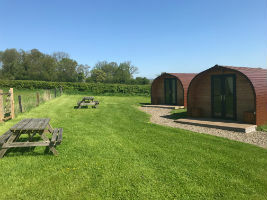 The lodges are close to Mortimer’s Forest, the Wyre Forest, and the Clee Hills, offering a variety of places to explore on foot, or by mountain bike on dedicated trails. 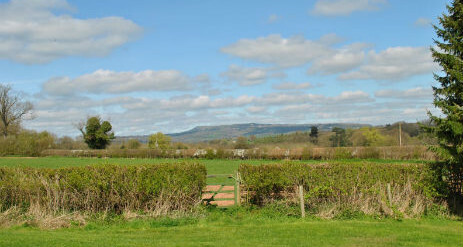 Set in the Teme Valley, the area is renowned for its food produce, with many cafes, pubs, and eateries welcoming dogs. Considered the prettiest town in England, visiting the medieval walled town of Ludlow is recommended during your holiday, and is just 10 minutes away by car. 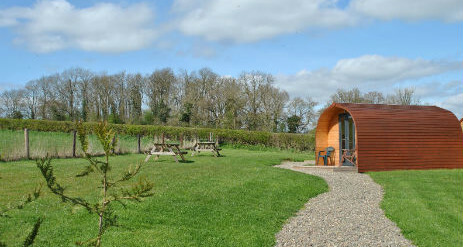 The lodges are warm and well insulated, making them snuggly on cooler nights, and cooler on warm evenings. The french doors open up onto your own personal decking area, and there are picnic benches dotted around enjoying different views. Each lodge is equipped with tea/coffee making facilities, and cotton bed linen. The village of 7 lodges is available for hire, along with our fully licensed function room for celebrations. Beautiful bespoke, wood-clad structures, our lodges are equipped with heating, double glazed doors and windows, and basic tea/coffee making facilities. 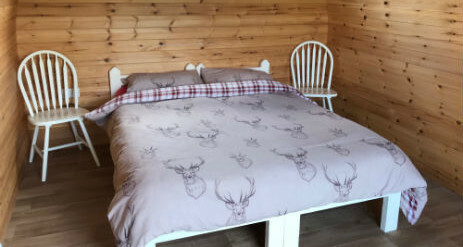 Each lodge has handmade wooden beds available as doubles or singles, and come complete with mattress, pillows, duvets and cotton linen bedding. 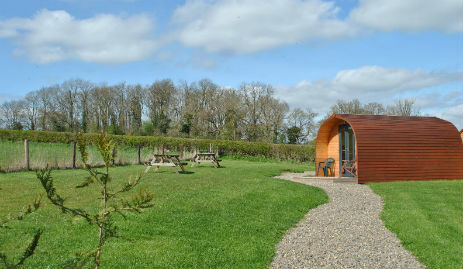 The lodges are warm and well insulated, making them snuggly on cooler nights, and cooler on warm evenings. The french doors open up onto your own personal decking area. There are 7 lodges in total. 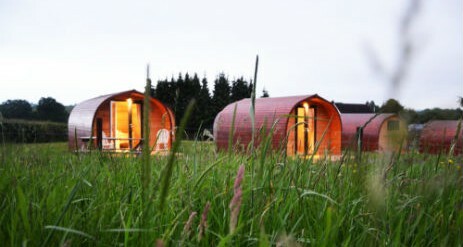 6 deluxe lodges sleep between 2 and 3 people, 1 lodge sleeps 2 comfortably. 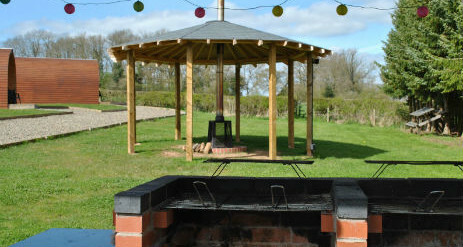 The village of lodges sleep up to 20 people, making it ideal for group gatherings. Prices start from £54 per night, based on two adults sharing. One additional adult can be added for £15 per night along with a dog cleaning levy of £15 per stay. A two night minimum stay applies if you wish to stay over a weekend. 1 Night stays available from Sunday to Thursday evenings. 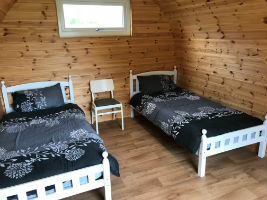 The price per tent is £25 for 1 night, based on two adults sharing and £36 for 2 nights, £54 for 3 nights and additional adults cost £10 each per night. Dogs cost £15 per dog per stay. Families with children are welcome if you book the entire village which sleeps 12-20 people.